This post is a long time coming and I know it’s very late but hey, maybe it’ll be good to rekindle some of the fire from this competition in anticipation of upcoming Nationals. TIDBRF was a weekend of huge ups and downs and the way things panned out was almost as if it were the plotline of a movie. So many emotions, it was definitely a dramatic weekend to remember. I was going to write a post about Eric being my new favourite because he bought me a breakfast sandwich, but then he ruined it by being a brat and calling me old and fat. So let it be known that Eric is the worst. And he is also fat. And a baby. Lily still needs to babysit her little cousin. I realize this post is quite late. It was Fat Day #2 two Wednesdays ago! This time, I celebrated my birthday with my Iron Dragons family. We went out for sushi! I haven’t really been to that many AYCE sushi places so I asked for suggestions. Julian gave me a few, including Sushi House, Kyoto House, and Kuni Sushi Ya. Out of his suggestions, the only one I had been to before was Kuni Sushi Ya, as it’s relatively close to school and my labmates like it a lot. It was a bit of a last-minute planned event, as I wasn’t even able to confirm the date until the day before the event. I didn’t really care where we went so I asked Julian to pick a place and he picked Sushi House. So that’s where we went! I somehow managed to get a Starbucks rewards card promotion, which came with a free drink, and thus my quest for the perfect (free) Starbucks drink began. You have to understand that this quest is no ordinary task. It isn’t easy to find the perfect Starbucks drink. The biggest problem: I don’t like coffee. There’s something very satisfying about moving up a plate size. Today was a big cooking day. 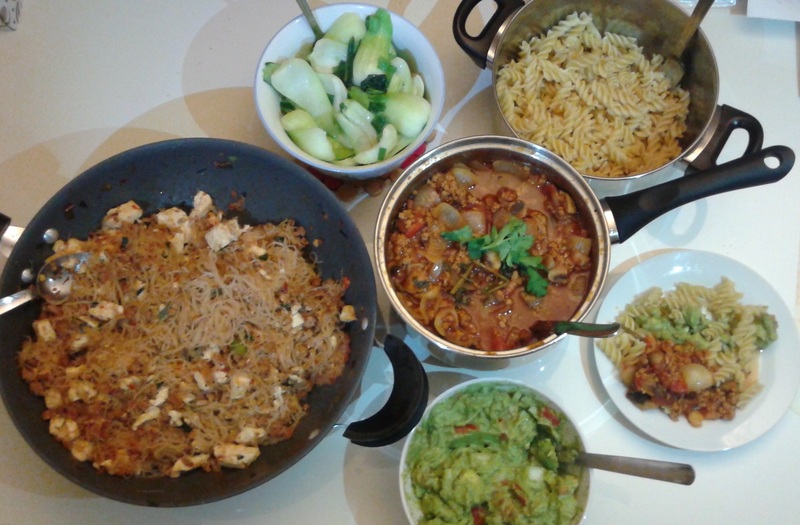 Chris and I made mapo tofu, bok choy, pasta with pasta sauce, and guacamole. All for about $20! All together, this batch should last us at least 20 meals between the two of us, making for about a dollar per meal. I will add that we do make more pasta throughout the week and the picture below was also taken after we had eaten a bit, so it doesn’t show everything.